Da dieser Blog sonst in Deutsch geschrieben ist, soll zumindest eine kurze sprachliche Überleitung ins Englische erfolgen. Da ich stark davon ausgehe, dass alle Leser dieses Blogs in gleichem Maße mit englischsprachigen Content vertraut sind, werde ich nun auf Englisch wechseln, viel Spaß beim Lesen! The fourth annual HeroConf London event took place in London on October 22 – 23rd . Based on the consistently outstanding work around its PPCHero brand, including the ppchero.com blog and the HeroConf event series in the US, the Hanapin marketing has managed to create a viable counterweight to the worldwide SMX series in the category of international PPC conferences. The 275 attendants traveled from 56 countries – including Australia, Siberia, Japan – to soak up the insights of 4 keynotes and 40 sessions on 4 simultaneous tracks. 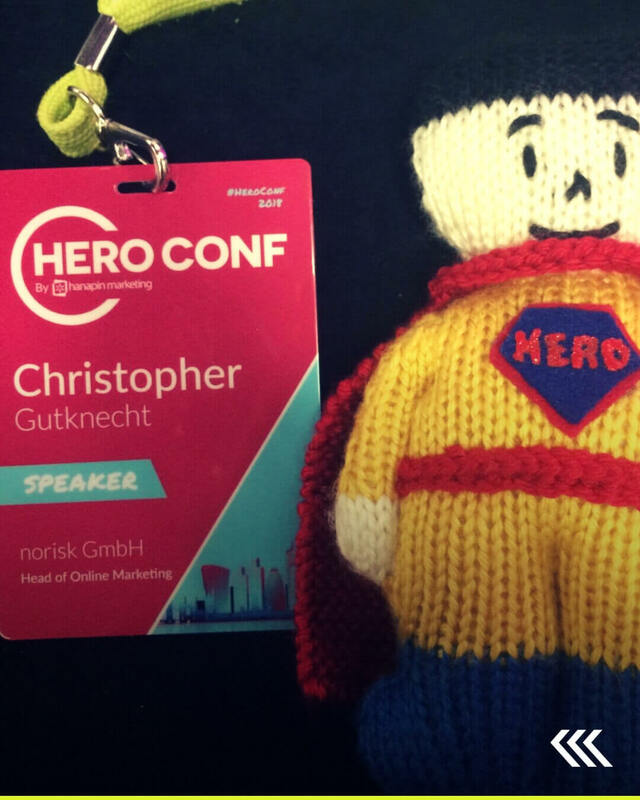 This event summary shares my notes and observations from the sessions I attended, the overall event experience and of course my own talk with Philipp, which won the hero award for Best Overall Presentation. More on that in section 6 and 8. Inspired by the quality of some of 2017’s winning presentations – shout out to Sean Murphy, Liam Wade and of course the almighty Martin Röttgerding – I decided to submit a session on the topic of automating search queries. To build a strong case, I partnered with my good friend Philipp Mainka from Sixt, who lead the PPC department there (until October) and had also been working on the same topic for a while, with impressive results. Philipp and I submitted my session topic via the call for speakers form on the PPC Hero page about three months prior to the event. The content requirements for submission were strict: actionable, specific, innovative and non-recycled. In the runup to the event, the Hanapin team did a great job of keeping speakers informed about the specific next steps. Early deck submission. The slide decks had to submitted two weeks prior to the event so that they could be uploaded into event app for attendees to flip through before the actual talks. This was very helpful to decide on some tied sessions in the same slot. Consistent CI in presentations. All speakers had to use a HeroConf slide-format, which included colors, elements and logos. This created a consistent visual flow across all sessions and let attendees focus on the content, not the logos and colors of presenting companies. Great idea. I will conclude with the overall event experience at the end of this post, but can spoil with this: With every detail of the experience, you can tell that the HeroConf team deeply cares about 1) PPC and the community and 2) delivering a great experience to everybody. But let’s dive into the session recaps now and soak in some purple-pink lighting. For those who don’t know Daniel: He was named #1 Most influential PPC expert in 2018 and has grown his agency Brainlabs to 200 people in 6 years. For most he is known for useful scripts that he posts on Search Engine Land – including the latest exact match reversal update. Daniel delivered an entertaining keynote on ways to reflect on your own PPC career and reassess what is necessary to succeed. Two weeks before the event, Daniel became a father of identical twins: he joked about calling them ‚A‘ and ‚B‘ – the perfect opportunity for a split test. An app-based poll revealed that 65% of the attendants were agency-based, 20% were from brands. On the inhouse vs agency debate, he noted it is far easier to move from agency specialist to an inhouse role, gradually increasing exposure to more marketing channels. It is significantly less common to transition from a long in-house tenure to agency-side, as there is less opportunity to build deep technical expertise in specific areas such as bid management or Shopping, which are key to surviving in agency projects. In this vein, Daniel recommended that junior managers should aim to become the ‚go-to-person‘ for something, whether it be Excel, reporting, audience, automation – to build detailed knowledge in one specific area and gain credibility within the team, becoming an indispensable team member in the mid-term. This extends to Senior managers in the way that Daniel would much rather hire candidates with a few specific strengths than an overall average or balanced score throughout all skills. One obvious path is to ‚hop on the automation train‘ – as Daniel called it – and learn the language logic: Many PPC tasks are highly susceptible to becoming automated based on their data-driven scope. Daniel finished off on a positive note: The paid search market is expected to consistently grow until 2020 and beyond, demand for PPC experts is higher than ever. Nevertheless, constant reevaluation and continuous learning is crucial to stay ahead of the curve. Daniel’s Deck can be found here. What can changed to make the image stand out? Can image size be changed? Can the perspective be varied? In fashion: can model shot be delivered? The more comparable a product is, the higher the potential impact of this tactic. In Dave’s experience, seller ratings (product and merchant-level) have the second-strongest influence after price changes: He typically saw a 20% uplift in CTR and conversions comparing the periods before and after implementation. Depending on the review vendor, product-level ratings are not necessarily easy to implement, but well worth the effort. The first best practice on pricing was to run gradiated discounts, creating loss leaders on very cheap products as a direct effect, but generating a huge amount of head-term shopping traffic due to on good pricing and higher CTR. Dave recommended to be creative and frequently submit some kind of shopping promotion extension to leverage the strong visual effect of promotions in product boxes. Overall though, slash prices seem to have a much stronger effect on impression share than promotion extensions. Dynamic repricing has an extremely direct effect on CTR: As soon as the competitor price drops significantly, your CTR tanks as well. Amazon is known to be in a league of it’s own when it comes to forecasting the relationship of price and demand changes, so retailers should at least start monitoring these variables. There are out-of-the-box price monitoring tools such as import.io , priceAPI or search monitor to get started, but can get expensive when the approach is scaled. Talking to Dave on some of the technical details later that evening, it got me psyched on building my own price monitoring tool in Python – stay tuned. Perform a search term gap analysis and add missing terms from converting queries to your titles. Author’s note: Our norisk Shopping query report script would be a good place to start. Google has an incentive to increase CTR and often shows a range of lower price and high price products. To reduce this overlap on queries, simply set the unwanted ones temporarily out of stock (mostly higher-priced). Author’s note: This is not easy to implement, but worth testing. These are two reasons why Dave is a proponent of a search-term led approach to account structure. To conclude: Great talk, many hands-on ideas to take home and test on shopping campaigns straight away. For a detailed view, see Dave’s slides here . Just as important are audience exclusions based on negative lists, keywords and placements, as well as the fine-tuned combination of the two elements. Julia coined the term „Premarketing“ to describe similar or lookalike users to previous website visitors, which can be a strong enhancement to retargeting when finely segmented by interests and behaviour. She described how to successfully wire the Google ecosystem for deeper audience sharing: Google Analytics as the engagement-based audience builder, Google Search, GDN & Youtube as different touchpoints throughout buying phase, and even Google My Business to tie in local events such as instore visits. A smart way to transfer the audience depth to Facebook ads is to rebuild segments by UTM-parameters in the landing pages. This will generate highly targete custom audiences. Helpful in this segmenting process is Facebook’s audience overlap tool to keep the smaller audience buckets clean. Author’s note: As the process is manual, this works for large campaigns but is hard to scale across many retail clients. Nevertheless a good approach worth testing. Conclusion: Excellent talk reminding marketers that audience building offers 1) many different data sources and 2) can be creatively repurposed to deliver great results at little extra budget. Julia’s Audience Targeting slides can be found here. From his agency experience at Stockholm-based Docklin Digital, Dennis shared several Shopping best practices to go beyond the three campaign priorities as defined by Martin Röttgerding in 2014. Martin’s structure enables brand-based retailers to target generic, brand and product-based queries with different bids, in three separate campaigns. The approach has since also been repurposed for other dimensions besides brands, as Liam Wade showed at HeroConf 2017. Product campaigns are split likewise on medium and low-level, but can be scaled horizontally to allow for multiple subsets of low/mid product campaigns, such as cowboy boots, categories or brands. Obviously, building and maintaining the structure can not be done manually. Dennis and his team are using Ads scripts for this purpose. Unfortunately he didn’t share any code which left users with a theoretical deepdive. The necessary script operations are mainly fetching data from a GMC feed, check if the adgroups and product groups exists, and set bids accordingly. Dennis‘ slides can be found here. Entity limits. Google only allows 20k adgroups per campaign, or 20k product groups per adgroup. Any approach needs to work for 10k and for 200k SKUs, changing the structure half way is a huge pain. This setup is painful to maintain if all subtypes scale are divided into buckets 20k due to limitations. Campaign multiplication. Creating the three campaigns and splitting by device makes six campaigns. Further splitting often yields no additional benefit if budget are unlimited and performance is managed on a bid-level. At 2.15 pm Philipp and I finally hit things off in the second-largest room. The session was packed with about a 100 people, so the topic seemed to have a hit a nerve. For impatient readers: The session slides can be found here, the accompanying code and notes on github here. Philipp and I had separately been working on the topic on automating new converting queries for the last 1,5 years. My team at norisk focused on retail clients, Philipp and his team at Sixt dealt with geo-related queries. The idea of this talk was to show the combined learning curve of two teams in two industries, retail and travel. When joining forces in July and gathering our material, we realized that there are many pieces to solving the puzzle and wanted to arrange these in an order of complexity, hence the extended title ‚From Simple Tactics to Machine Learning Approaches‚. Campaigns Managed by Google, a 3rd-party tool or by You? In the wake of ever-improving machine learning, Philipp opened by asking if account manager control is even necessary anymore? Yes, it is! Not because of limiting the amount of budget lost in Google experiments, but to remain the head chefs in the PPC game of tomorrow: If we fully delegate the understanding of search intent to other tools, we are handing over the core task as PPC managers. We have to stay at the forefront of this challenge and keep experimenting! Getting into more detail, I restricted focus to identifying new converting keywords and understanding their components. Looking at shopping query example, many brands and categories can be recognized at first glance. Yet the devil is in the detail. Philipp mapped out the entire automation process for into eight steps. In both the retail and the travel context, Philipp and I concluded that the entity recognition step is most crucial step. The rest can be handled by a bulk upload or script that receives a csv-type data structure. We at norisk have built a campaign automation tool to handle this. Philipp & I mapped our takeaway tips for entity recognition from simple to complex into four main buckets. The following description only serves an overview, for more details please refer to the slide deck and the accomanying github page. Use your product entities. Every website with filters has entity lists to refer to for recognition. These often deliver 80% of extraction accuracy, but the last 20% are a painful collection of individual edge cases such a typos, variations etc. The detection algorithm shown runs through a list of entities and tries to get the highest match, then gradually settles for less matches. A demo video can be seen here on Youtube. Ask Google. For the 20% edge cases, enhance your model with Google’s language capabilities. This can be using the suggest API to recognize typos such as ‚aveda foo relief‚, validate geo-entities via the Knowledge Graph API or using a Google site-search to find the best landing page for ‚nike air max‚. Start with Machine Learning. As it impossible to cover the topic of ML in 5 minutes, we simply shared tips on how to start playing around with Python packages. Besides the string-comparison package FuzzyWuzzy – which can be accessed via this Cloud function – you start experimenting with Spacy or check out Google’s cloud tools such as AutoML for NLP. One thing is sure though: You have to learn to code! Supervised Machine Learning. As a final advanced approach, Philipp shared how Sixt solves ambiguity in entity detection using a mobile app. The feedback is stored in BigQuery and fed back into a Spacy-based neural net to help for future classification. Conclusion: Many entity recognition tasks can be solved with rule-based algorithms and deliver great results in in some domains, e.g. retailers with many product-specific queries. This approach is about understanding search queries and is not limited to Google Ads queries, it can process Search Console or external keyword data and map queries to a website’s ‚inventory‘. The road ahead includes a toolbased approach to find new good queries, recognize the entities with an internal and several external models (collective intelligence) and use the entities as predictors in a regression model, that e.g. queries with nike and size can be added even before they generated a conversion, because other nike + size queries have shown great perfomance and thus have a high predicted profit per click. How do you auto-create the campaigns? This can either be done by building a bulk upload file or writing create method in in ads scripts. The subsequent attendee feedback was amazing: Philipp and I were awarded with Best Overall Presentation. We are thrilled! 8. Our Reward: HeroConf Award For Best Overall Presentation! Most entertaining: Daniel Gilbert, see section 1. We are so grateful to have received this award and relieved to see that all the hard work has paid off! The conversations during and after the conference have been amazing, the HeroConf crowd truly is a melting pot of international PPC experts. Toolwise it’s back to the drawing board and working on new features to improve model quality.